Head shot of author and historian Barbara L. Goldsmith (1931 - ). Barbara Goldsmith discusses Obsessive genius : the inner world of Marie Curie. 3 Emmy awards for "Little Gloria - Happy at Last" and "Bacall and the Boys"
Barbara Goldsmith was born in New York City. She graduated with a bachelor of arts degree from Wellesley College, after which she took art courses at Columbia University. Her first assignments as a journalist were in the art field, and then she wrote a series of prize-winning profiles of Hollywood stars such as Clark Gable, Cary Grant, Joan Crawford, and Audrey Hepburn. In 1967, she became a founding editor and writer of New York Magazine, for which she wrote about art and colorful figures in the art world. Tom Wolfe called her one of the originators of the New Journalism movement. Goldsmith wrote “Bacall and the Boys, ” a 1968 television special about Lauren Bacall in Paris with the young designers Yves St. Laurent and Giorgio Armani, which won her an Emmy award. Her first book, a novel called The Straw Man (1975), was a bestseller. It was followed by Little Gloria...Happy At Last (1980), a nonfiction account of the 1930s custody battle for Gloria Vanderbilt, which was another bestseller and was adapted into both a film and a television mini-series. 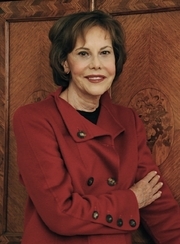 Her book on the the bitter family feud behind the lawsuit of Johnson vs. Johnson (1987), also was a bestseller. Other Powers: The Age of Suffrage, Spiritualism and the Scandalous Victoria Woodhull, was published in 1998, and Obsessive Genius: The Inner World of Marie Curie, came out in 2005. Barbara Goldsmith is currently considered a "single author." If one or more works are by a distinct, homonymous authors, go ahead and split the author. Barbara Goldsmith is composed of 2 names. You can examine and separate out names.